Travis Browne was one of those to intervene as WWE icon Bret Hart was attacked by a fan during a Hall of Fame ceremony in New York on Saturday night. Hart, who was accepting induction for the second time, was giving a speech inside the ring when a man jumped barricades and launched himself at the 61-year-old. Though Hart was taken down and punched by the man, he escaped without serious injury - perhaps thanks to the quick reactions of those who flooded he ring to stop the attacker. 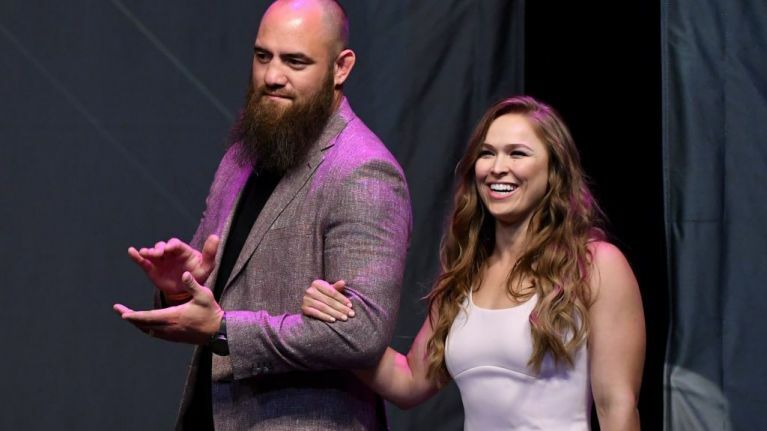 As multiple reports point out, Browne, the husband of Ronda Rousey, was one of the first on the scene. Though WWE's feed instantly went down when the attacked reached Hart, footage posted on Twitter appears to show Browne punching the man in the seconds that followed. Hart didn't require any medical attention after the incident and was even composed enough to finish his speech when the man had been taken away. "An over-exuberant fan surpassed our security at ringside and made his way briefly into the ring," a statement from WWE later said. "The individual has been turned over to the proper authorities." A spokesperson for the New York Police Department said the fan, a 26-year-old man, is believed to have punched Hart at least once during the incident. He is said to be being held at a police station in Brooklyn while charges against him are being filed.